Judge Peter Smithwick was tasked in 2005 with investigating the allegations that members of An Garda Siochana, the 26 County police, colluded with the Provisional IRA to ambush two senior RUC men. In his final report, he sustained the allegations of Garda collusion but without pointing to any clear evidence to support the claim. RUC Chief Superintendent Harry Breen and Superintendent Robert Buchanan were shot dead shortly after crossing the border into south Armagh, following a meeting in Dundalk Garda station in County Louth on March 20 1989. Breen was considered a key target for the IRA because his command had included the south Armagh area. He was also linked to the notorious ‘Glennane gang’, a group of loyalist and Crown force assassins which targeted prominent nationalist civilians. Almost immediately after the attack, unionists began demanding a probe into how the IRA had been able to track the RUC men’s unmarked vehicle. Tabloid newspapers speculated that IRA surveillance alone could not have succeeded, and rumours mounted of an IRA ‘mole’ in Dundalk Garda station. As a result of an agreement in 2001 between the Dublin and London governments, part of which concerned the issue of state collusion, the Smithwick Tribunal of Inquiry was established in 2005. 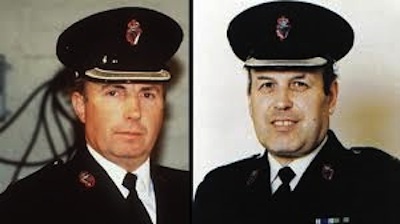 Of the six cases of alleged collusion investigated at the request of the two governments by Canadian Judge Peter Cory, only one fell to the Dublin government, that of the deaths of the two RUC chiefs. After conducting a private investigative phase, Judge Smithwick held a series of public hearings over 130 days in Dublin. As the scope of the tribunal widened to include other incidents and controversies dating from the period, he took evidence from 200 witnesses, including from members of the IRA. Former Provisional IRA Volunteers also denied any garda involvement in their operations. They said that one of the RUC chiefs had been recognised on a previous occasion and that they had set up a reconnaissance post overlooking the Garda station. However, much of Judge Smithwick’s final report appeared to pivot on a contribution of “secret evidence” from the PSNI last year, the contents of which remains unknown. Statements made by the IRA and answers it provided to the tribunal’s questions were largely ignored. While the tribunal said it accepted the denials of three former garda sergeants - Owen Corrigan, Leo Colton and Finbarr Hickey - that they had any role in assisting the ambush plot, Smithwick still reached the conclusion that ‘on balance of probability’ there was a Garda acting as a ‘mole’. Smithwick said his tribunal had ‘not uncovered direct evidence of collusion’ -- but then on the basis of circumstantial and untested ‘intelligence’, he said that some form of collusion indeed took place. The Justice minister in the 26 Counties, Alan Shatter, rushed to make a apology for the alleged Garda misdeeds, while the Garda chief Martin Callinan said he was “horrified”. Those statements encouraged unionist politicians such as Gregory Campbell to demand a general apology from the 26 County state for wider, and wilder, accusations of collusion, including suggestions that the Dublin government helped to form and develop the IRA. Unionist claims that a parallel existed between the actions of the Gardai and the collusion of the British Crown forces with unionist paramilitaries were angrily dismissed. “What Justice Smithwick defines as collusion is very different in form and scale from the collusion that occurred in the north,” said Sinn Fein leader Gerry Adams. He said the British government had arrogantly disregarded the unanimous all-party motion of the Dublin parliament calling on it to provide vital information about those bomb attacks. He also pointed out that the agreed Pat Finucane Inquiry, into the murder of the Belfast defence lawyer in 1989, continues to be blocked by the British government. Mr Adams said he had personally helped to facilitate the engagement between the former IRA volunteers and the Smithwick Tribunal due to the responsibility to assist families bereaved in the conflict. But comments made by Mr Adams on Wednesday were seized upon by his opponents in the latest episode of an ongoing political onslaught against the Sinn Fein leader in the 26 Counties. Fianna Fail leader Micheal Martin declared as “incredible” comments in which Mr Adams attempted to set the incident in the context of the intense conflict which was taking place between the IRA and the Crown forces in south Armagh at the time. Mr Adams pointed to the security failings of the two very recognisable RUC chiefs as they drove deep into IRA territory without any military or police escorts. Another point which provoked claims of outrage was Mr Adams’s description that the two RUC men and the IRA Volunteers had been “doing their duty”. The comments sparked angry denunciations of Sinn Fein in the Dail and later on Irish television. Commenting on the criticisms of his remarks, Mr Adams said said he was very conscious that at the heart of the issue were two bereaved families. “I did not need reminded of this by any of my political opponents and I am concerned, as I was during the Newstalk interview, not to say anything which detracts from that or which causes any further hurt,” he said. He said the report had documented the risks faced by the RUC men travelling to Dundalk through South Armagh. “It is a fact that RUC Officer Bob Buchanan was crossing the border on average 10 times each month and on most occasions he travelled in his own car which was ‘readily identifiable’. He said it was “nonsense” to suggest that he was blaming the two RUC men for their own deaths. “Everyone knows the IRA was responsible. That was never in question,” he said. “None of this distracts from the tragedy and loss of life. He described the reactions of the Fianna Fail leader Micheal Martin as a “contrived outburst” and those of Justice Minister Alan Shatter and others as “pompous”. But they illustrated the importance of such a debate. “Why are they not open to discussing the proposal put by Sinn Fein for a comprehensive, victim centred, truth recovery process under the tutelage of an independent international agency?